(from left to right) Axel Fuchs, Mayor of the City of Jülich; Bernhard Hoffschmidt, Director of the DLR Institute for Solar Research; Georg Menzen, Head of the Department of Energy Research at the German Federal Ministry for Economic Affairs and Energy (Bundesministerium für Wirtschaft und Energie; BMWi); Johannes Remmel, the North Rhine-Westphalia Minister for Climate Protection, Environment, Agriculture, Nature Conservation and Consumer Protection; Karsten Lemmer, Executive Board Member for Energy and Transportation at the German Aerospace Center (Deutsches Zentrum für Luft- und Raumfahrt; DLR); Kai Wieghardt, Project Manager for Synlight; Carlo Aretz, Managing Director of the Jülich Research Centre (Forschungszentrum Jülich; FZJ). 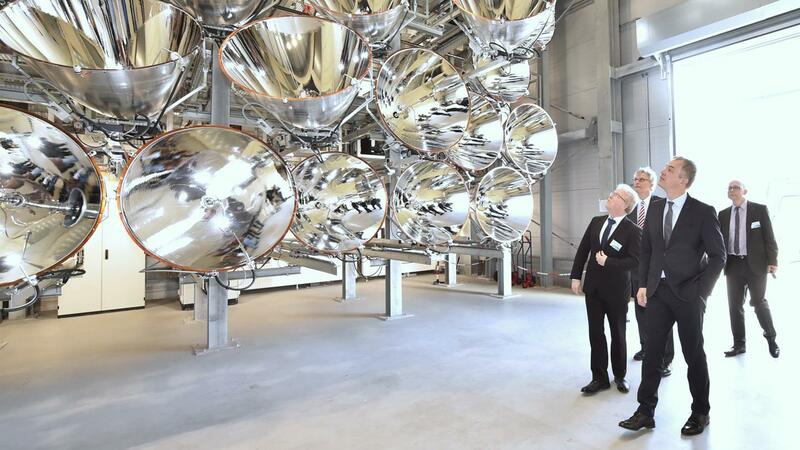 Johannes Remmel, the North Rhine-Westphalia Minister for Climate Protection, Environment, Agriculture, Nature Conservation and Consumer Protection is impressed by the size and appearance of the Synlight facility upon arrival. Synlight consists of a total of 149 high-power light sources, each of which is a seven-kilowatt xenon short-arc lamp, as used in cinema projectors. Each source can be individually controlled, which allows various configurations and temperatures in the focal point – even in three simultaneous experiments. 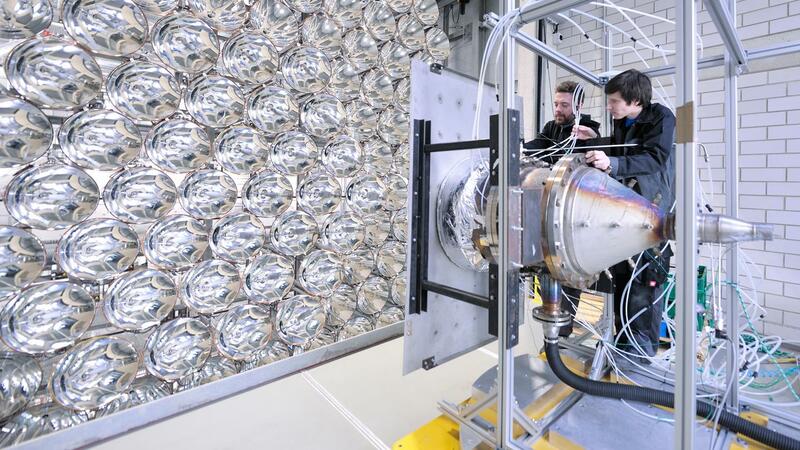 Technicians from the DLR Institute for Solar Research inspecting the seven-kilowatt xenon short arc lamps in the high-power light sources. Test can be carried out in three test chambers. Water flows through this reactor, and hydrogen is extracted using the energy of the concentrated light. The outwardly inconspicuous building that houses Synlight is situated in Jülich. In the grey hall behind offices and workshops is the 15-metre-high experimental facility. The world's biggest solar simulator is located at the DLR facility in Jülich. 149 high-performance Xenon short-arc lamps simulate natural solar radiation. Independent of weather conditions, the simulator will bring faster progress to solar fuel manufacturing. 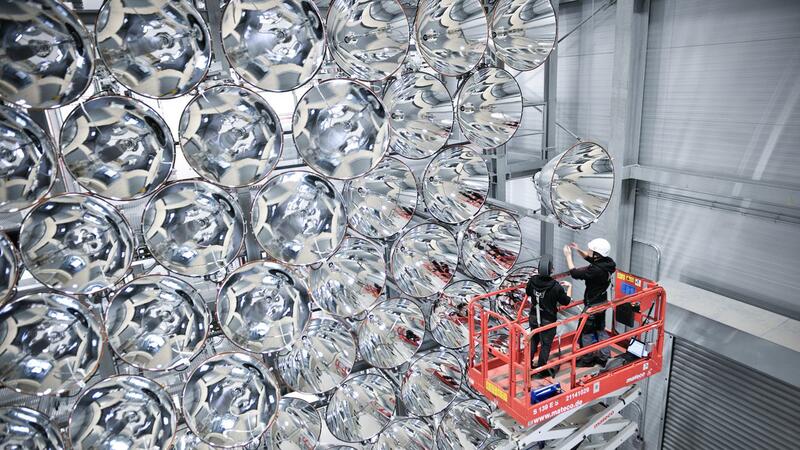 The world's largest artificial Sun started shining in Jülich on 23 March 2017. Johannes Remmel, the North Rhine-Westphalia Minister for Climate Protection, Environment, Agriculture, Nature Conservation and Consumer Protection, joined Georg Menzen of the German Federal Ministry for Economic Affairs and Energy (Bundesministerium für Wirtschaft und Energie; BMWi) and Karsten Lemmer, Executive Board Member for Energy and Transportation at the German Aerospace Center (Deutsches Zentrum für Luft- und Raumfahrt; DLR), to inaugurate the new research facility Synlight. Among other things, the facility is intended to develop production processes for solar fuels, including hydrogen. Remmel emphasised the significance of research for the energy transition: "We need to expand existing technology in practical ways in order to achieve renewable energy targets, but the energy transition will falter without investments in innovative research, in state-of-the-art technologies and in global lighthouse projects like Synlight." In the three-storey Synlight building, there are 149 Xenon short-arc lamps. For comparison, in a large cinema, the screen is illuminated with a single Xenon short-arc lamp. The scientists can focus these 'radiators' on an area of 20 by 20 centimetres. With Synlight's 350-kilowatt array, this results in 10,000 times the intensity of the solar radiation at Earth' surface. Temperatures at the target point of the lamps can reach up to 3000 degrees Celsius. Researchers use these temperatures to manufacture fuels, including hydrogen. Hydrogen is considered to be the fuel of the future because it burns without producing carbon dioxide. But the production of hydrogen – by splitting water into its constituents of hydrogen and oxygen – needs significant amounts of energy. In future, this will be obtained from the Sun. "Renewable energies will be the mainstay of global power supply in the future," said DLR Executive Board Member Lemmer, emphasising the relevance of intensive research into alternative energy production. "Fuels, propellants and combustibles acquired using solar power offer immense potential for long-term storage and the production of chemical raw materials, and the reduction of carbon dioxide emissions. Synlight will enhance our research in this field." 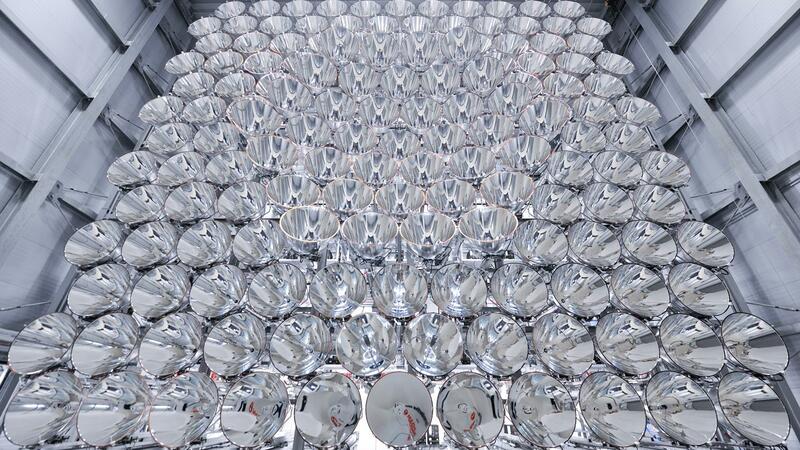 Sunlight in central Europe is unreliable and irregular, so an artificial Sun is the preferred choice for developing production processes for solar fuels. Periods of unfavourable weather and fluctuating sunlight hours might otherwise negatively impact tests. Relocating research facilities to more sunny regions only appears to offer an improvement in these conditions; even at these locations, the Sun never shines with a constant intensity. In addition, a test environment with precisely reproducible conditions is key to development work. Scientists at the DLR Institute of Solar Research already managed to produce hydrogen using solar radiation several years ago, albeit on a laboratory scale. The size of these processes needs to be enlarged significantly to make them interesting for industrial applications. This is the objective of Synlight. "Synlight fills a gap in the qualification of solar-thermal components and processes," explains Kai Wieghardt, who played a key role in the development and construction of the facility. 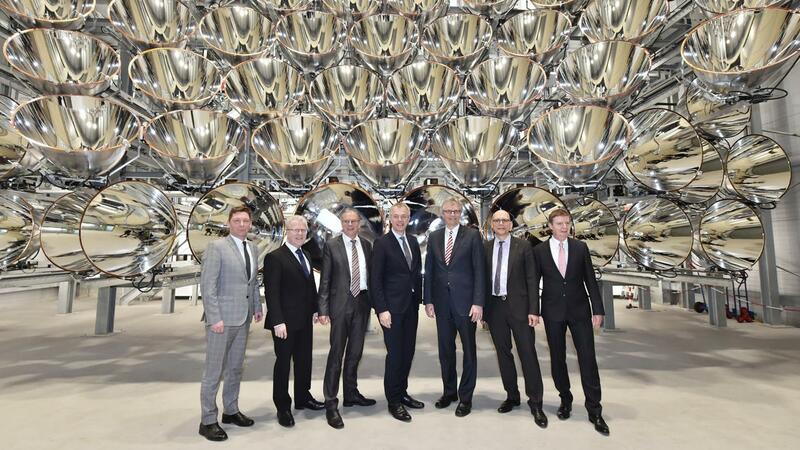 “The scale of the new artificial Sun is between laboratory systems like DLR’s high-performance lamps in Cologne and the large-scale technical facilities such as the solar tower here in Jülich." Three radiation chambers are available for experiments. The required radiation can be directed towards each chamber. To do this, the necessary lamps are targeted at single target points or the wider surface of the test system, depending on the requirements. This enables simultaneous preparation of several experiments and optimum utilisation of the facility. 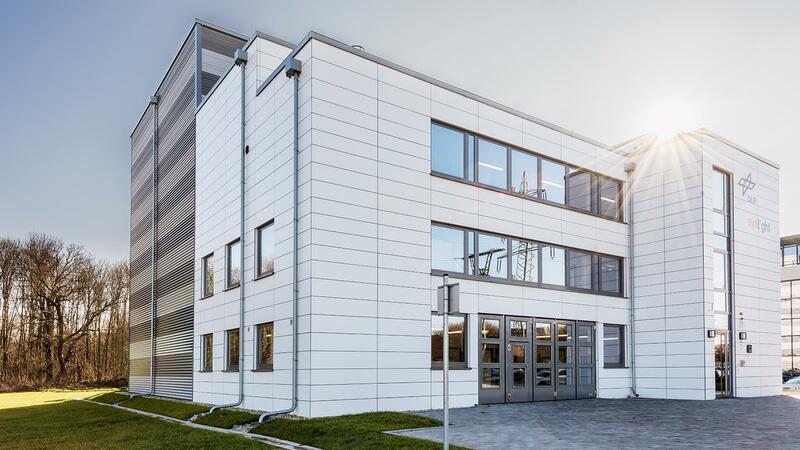 The DLR Institute of Solar Research has implemented the research facility in a building constructed by the Jülich Research Centre (Forschungszentrum Jülich; FZJ) over the last two years and rented to Synlight for the long term. The state of North-Rhine Westphalia supported the project with 2.4 million euro, approximately 70 percent of the total sum of 3.5 million euro. The difference of 1.1 million euro was provided by the BMWi.